Monitoring very high speed links Gianluca Iannaccone Sprint ATL joint work with: Christophe Diot – Sprint ATL Ian Graham – University of Waikato Nick McKeown. 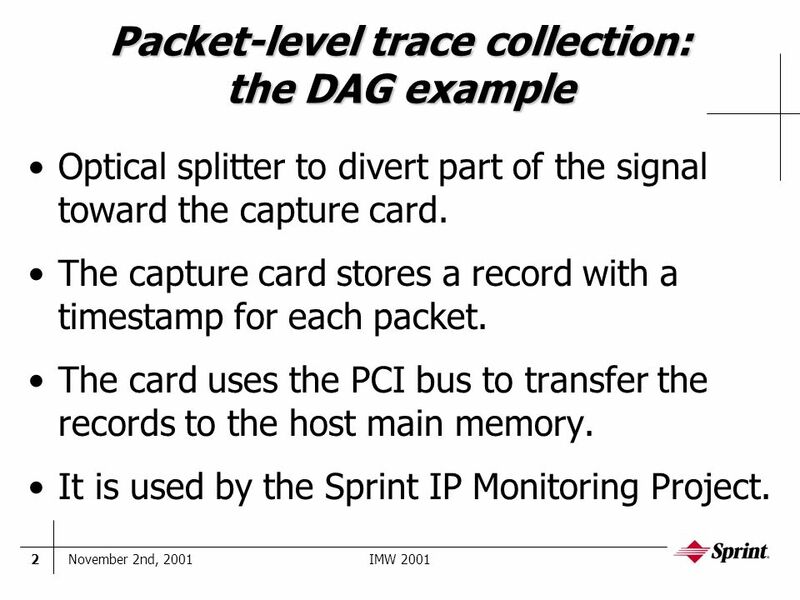 2 November 2nd, 2001IMW 20012 Packet-level trace collection: the DAG example Optical splitter to divert part of the signal toward the capture card. The capture card stores a record with a timestamp for each packet. The card uses the PCI bus to transfer the records to the host main memory. It is used by the Sprint IP Monitoring Project. 3 November 2nd, 2001IMW 20013 Challenges for next generation capture devices PCI bus throughput: –PCI 66Mhz/64bit is already challenged at OC-48 speed. Storage capacity and data management: –Several terabytes per trace collection. Memory access speed. Disk array speed: –OC-192 would require roughly 250Mbytes/sec (64 byte records, 300 byte average packet size). 4 November 2nd, 2001IMW 20014 Challenges for next generation capture devices (contd) Deployment of extensive monitoring facilities inside the routers: –Backplane speeds are in the order of hundreds of Gbps; –Stringent power and space constraints; –Switched backplanes reduce the advantage of being inside the router. 5 November 2nd, 2001IMW 20015 Our Goals Be capable of collecting packet at OC-192 speed with the current PCI technology. Develop a 4:1 compression technique. Minimize the loss of information due to compression. 6 November 2nd, 2001IMW 20016 System requirements Online processing required for compression. At OC-192 speed (10Gbps), a new packet arrives every 240ns (300-byte packets). –We can assume large average packet sizes because we can buffer incoming packets (once timestamped). 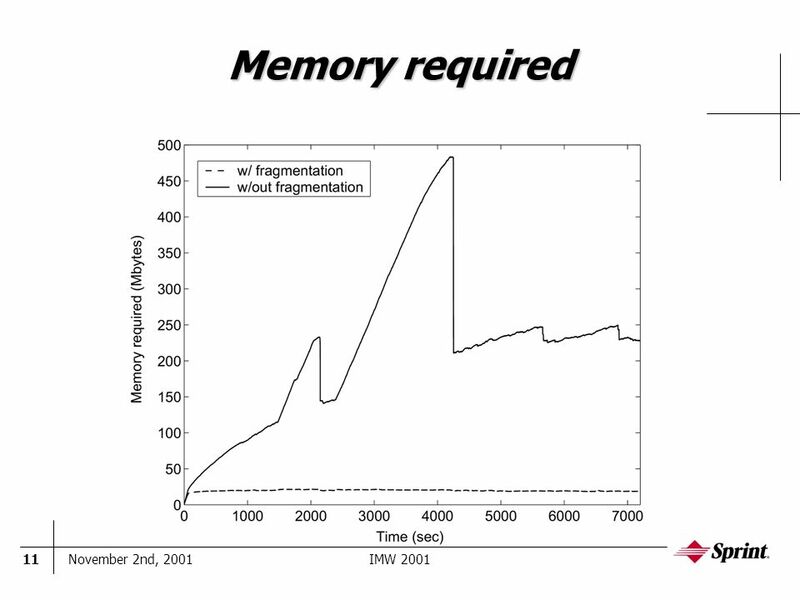 10 November 2nd, 2001IMW 200110 Flow fragmentation Long-lived flows can be a problem: –Large records and high bursts of traffic on the PCI bus; We set a limit to memory occupancy for a flow record (with relative packet records): –If the memory limit is exceeded, the Record Number is increased and the record is stored. –When the flow terminates the entire record is stored to disk with the Last Record flag set. 12 November 2nd, 2001IMW 200112 Preliminary performance study We have built a simple emulator to compress a packet-level trace. 5 different traces with different link utilizations and traffic patterns. Compression rates ranging between 3.20 and 4.02 (compared to DAG3 packet traces). 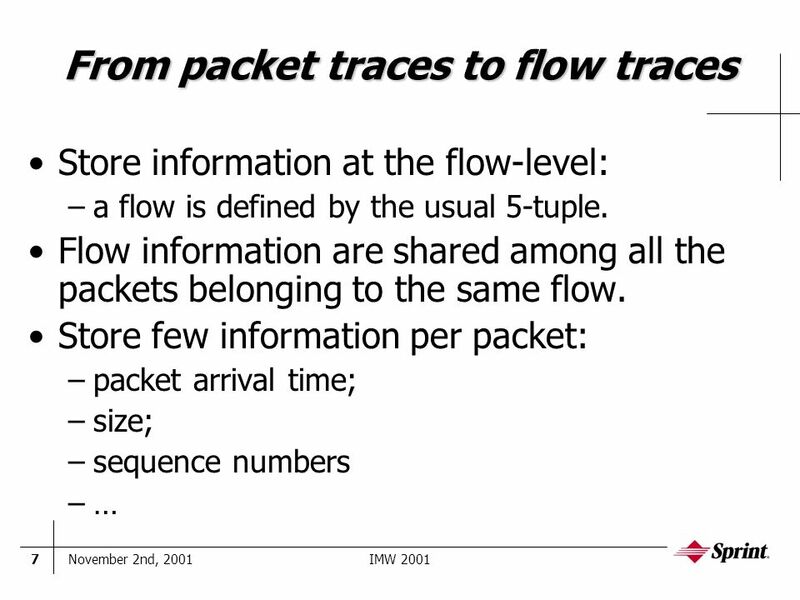 13 November 2nd, 2001IMW 200113 Hardware architecture Steps required in trace collection: –process framing information; –timestamp the packet; –classify the packet; –update flow/packet record; –store terminated flows to disk (background); All these steps can be pipelined: –Each step can be performed during the interval between two packet arrivals. 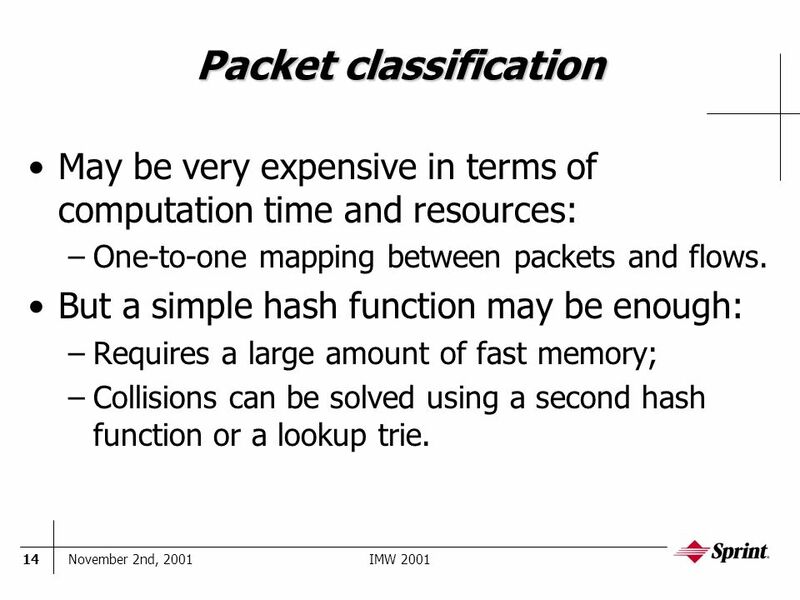 14 November 2nd, 2001IMW 200114 Packet classification May be very expensive in terms of computation time and resources: –One-to-one mapping between packets and flows. But a simple hash function may be enough: –Requires a large amount of fast memory; –Collisions can be solved using a second hash function or a lookup trie. 15 November 2nd, 2001IMW 200115 Conclusion New compression techniques are necessary to monitor OC-192/OC-768 links. We have proposed a novel scheme for flow- based trace collection. We have shown how to achieve compression ratio of 4:1 without losing much information. 16 November 2nd, 2001IMW 200116 Open issues and future work Detailed cost analysis (chipsets, memory). 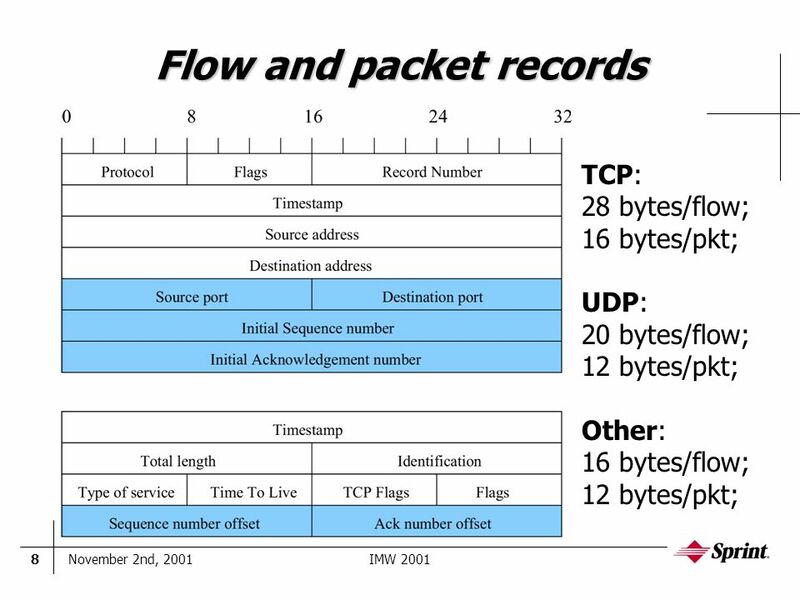 Packet classification performance. Second stage of record compression. Techniques to cope with traffic anomalies. Sampling techniques. 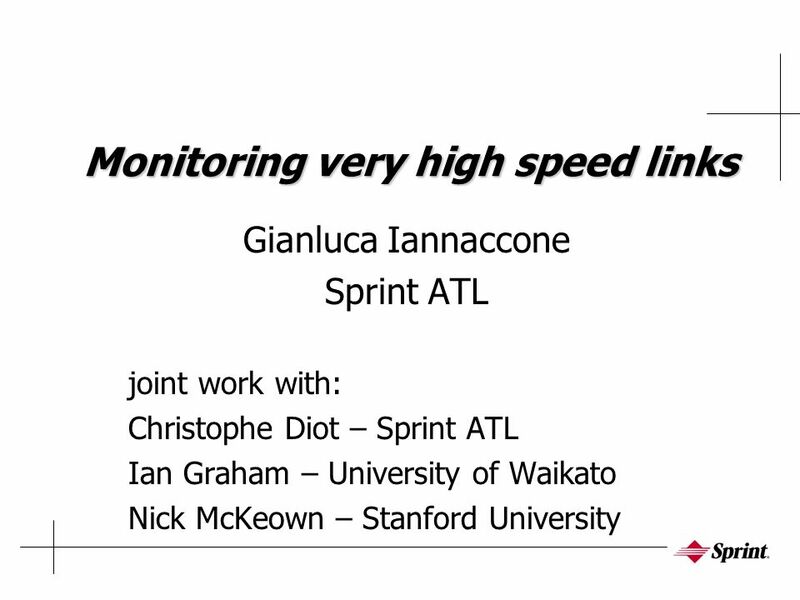 Download ppt "Monitoring very high speed links Gianluca Iannaccone Sprint ATL joint work with: Christophe Diot – Sprint ATL Ian Graham – University of Waikato Nick McKeown." Advanced Technology Laboratories page 1 Network Performance Monitoring at Small Time Scales Dina Papagiannaki, Rene Cruz, Christophe Diot. Characteristics of Network Traffic Flow Anomalies Paul Barford and David Plonka University of Wisconsin – Madison SIGCOMM IMW, 2001. Traffic Dynamics at a Commercial Backbone POP Nina Taft Sprint ATL Co-authors: Supratik Bhattacharyya, Jorjeta Jetcheva, Christophe Diot. Findings of the ADS-B Technical Link Assessment Team TLAT Co-Chairs April 2001 Constantine Tamvaclis Eurocontrol Experimental Centre ATM/CNS System Engineering. October 31, Metron Aviation, Inc. Dan Rosman Assessing System Impacts: Miles-in-Trail and Ground Delays. 1 Maintaining Packet Order in Two-Stage Switches Isaac Keslassy, Nick McKeown Stanford University. May 8, High Speed Electrical Testing Jim Choate Intel Corporation. 1 Overview Assignment 4: hints Memory management Assignment 3: solution. May 9, High Speed Protocol Additions John Garney USB2.0 Hub Working Group Chair Intel Corporation John Garney USB2.0 Hub Working Group Chair Intel. Author ： Xinming Chen,Kailin Ge,Zhen Chen and Jun Li Publisher ： ANCS, 2011 Presenter ： Tsung-Lin Hsieh Date ： 2011/12/14 1. 1 An Efficient, Hardware-based Multi-Hash Scheme for High Speed IP Lookup Hot Interconnects 2008 Socrates Demetriades, Michel Hanna, Sangyeun Cho and Rami. Multi-granular, multi-purpose and multi-Gb/s monitoring on off-the-shelf systems TELE9752 Group 3. Can Google Route? Building a High-Speed Switch from Commodity Hardware Guido Appenzeller, Matthew Holliman Q2/2002.